Work 365 Usage Based Subscriptions are used to invoice customers in arrears based on consumption. 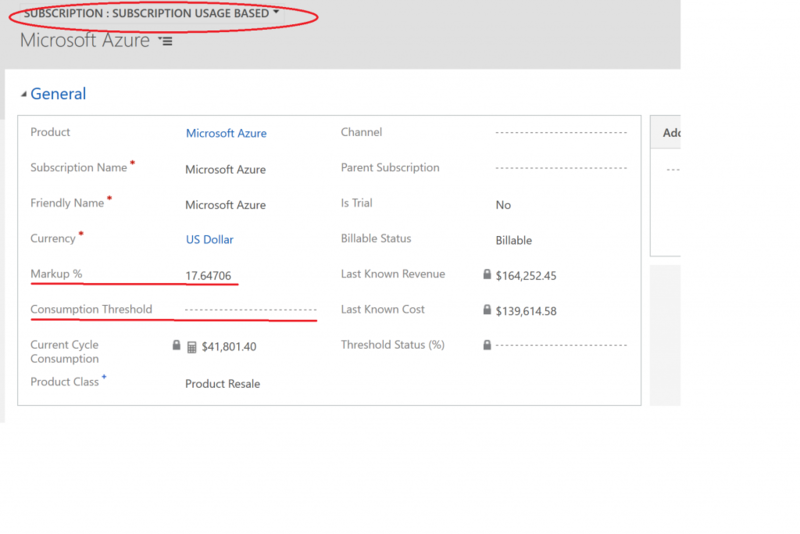 Currently in Work 365 the main consumption and Usage based subscription is used to Bill for Azure based Subscriptions. Azure is a usage-based subscription which means customers pay for their services after the usage of the services is reported. Microsoft retail price is $100 partners get billed $85. Standard Azure Margin is 15%. Which effectively means that the cost has to be marked up by 17.64 percent to equal retail price. Threshold Status: The percentage a customer has used up their consumption threshold amount. An email notification is sent to the Billing Contract Owner and the Manual Provider Email Recipient whenever a usage-based subscription reaches the 80% and 100% threshold marks. See the email template below. Markup Percentage: The profit margin on the subscription. Current Cycle Consumption: The customer’s actual consumption. The daily usage details are imported every day into the Work 365 application through the Work 365 Jobs//TODO through the Data Import mechanism in Dynamics 365. The price information under the usage summary are tentative prices, and they are only an estimate on usage consumption. As the records on the usage summary get pulled in, the Current Cycle Consumption field on the subscription get updated automatically. The monthly summary data is imported through the Provider Invoice. Microsoft Partner center makes the Provider Invoice available at the Billing Date and this data is synchronized with work 365. The customer facing invoice is created using the Markup percentage specified in the subscription. All the usage summary data from Microsoft’s invoice and reconciliation files is automatically sorted and assigned to the appropriate Azure Subscription and customer. Usage based subscriptions have the billing information for the previous month’s billing cycle on the billing contract invoices. The billing information will appear as a single line item on the invoice for the customer’s total consumption from the previous month. If an existing usage-based subscription does not have consumption from the previous billing cycle, the subscription is not included on the billing contract invoice as a line item because there is nothing to bill the customer. If you want an Azure subscription to be billed separately from your license or service based subscriptions, you would need to have a separate billing contract set up only for the Azure subscription. Note: Work 365 does not manage consumption levels; it only tracks consumption and notifies on consumption threshold statuses.